Hiya guys. I've been looking forward to Thursday all week because it's my Dads birthday. He is the most supportive person I know and has always been a rock for me. So I'll be with him all day eating out and hopefully having a blast. Anyway though, today I have a massively drool-worthy collection to share with you. Introducing the Bohemian Rainbow Collection by Seventy Seven Lacquer, which consists of eight beautiful holo polishes. The Bohemian Rainbow Collection by Seventy Seven Lacquer is currently available for pre-sale through Sunday. The official release date will be Friday, June 18th. This collection is available individually for $10 each and as a whole set for $70. Mini bottles, as shown in my photos, are not available at this time. Cash is a blurple toned holo polish. The color in this one is very rich and downright gorgeous. Definitely one of my favorites in this collection and probably in my whole stash. Great formula and consistency, not too thick or too thin. Shown here in two coats and sealed with Seche Vite. 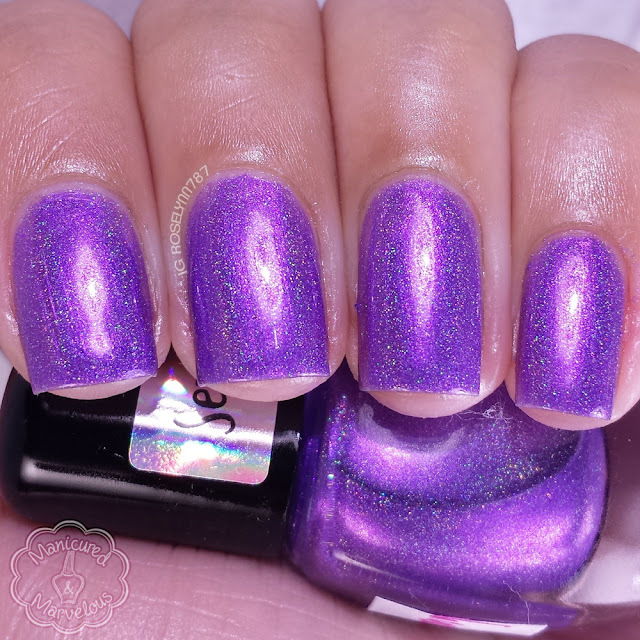 Harmony is a bright purple holo polish. There is always something about the color purple that screams summer fun to me. With all this holo sparkle how can we not have a blast, haha. Another must-have pick if you don't own anything similar. Same great formula as Cash with no application problems to report. Very opaque and dries on its own to a nice shine. Shown here in two coats and sealed with Seche Vite. Aria is a teal leaning on blue holo polish. I'm a loud and proud super-fan of the color tone so it should come as no surprise that this is a favorite. Now the color was very difficult to get accurate, hence the slightly different skin tone in these photos. Great formula and consistency, dries to a nice shine finish. Swatched here in two coats and sealed with Seche Vite topcoat. 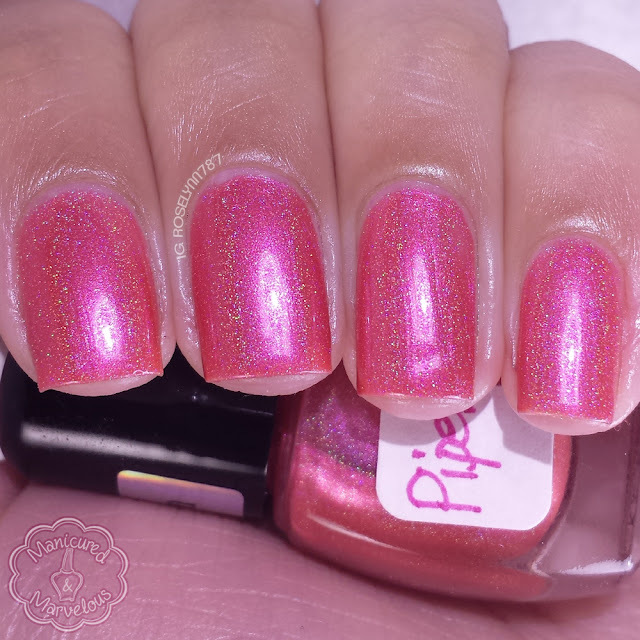 Piper is a pink holo polish. This polish slightly wants to lean towards red, but I don't feel it quite gets there. I wish it did though, I would have loved to see a nice bright red holo. Especially because the finish is so deliciously sparkly, definitely one of the more vibrant holos in the collection. Great formula and consistency, self levels perfectly. Swatched here in two coats and sealed with Seche Vite topcoat. Aspen is a light green holo polish. 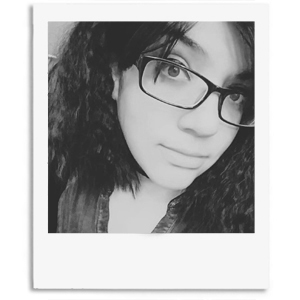 Admittedly a little lighter in color than I was expecting. It may be a combination of the tone, but the holo is extremely subtle in this one. The formula applied with ease, however, it's very sheer even when layered. Possibly a third layer would of given this what it needed so that there wouldn't be a visible nail line. Swatched here in two coats and sealed with Seche Vite topcoat. 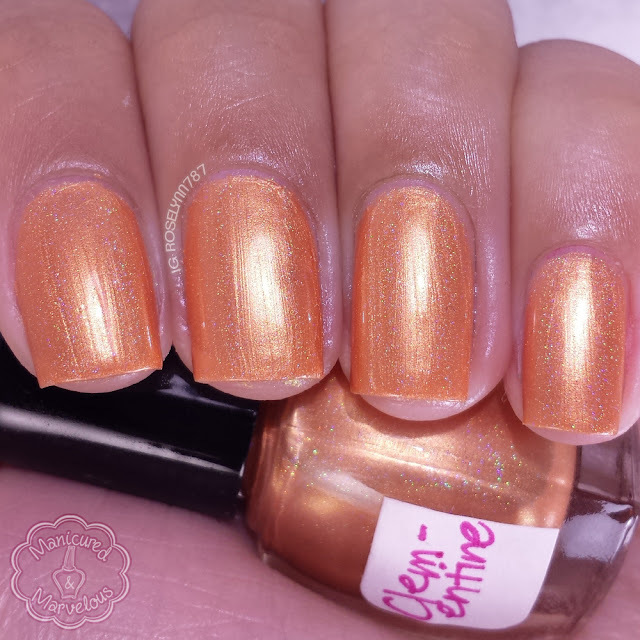 Clementine is a light orange holo polish. Almost reminds me of a sherbet ice cream. Orange tones have never suited my skintone very well, so unfortunately I have to say this one was my least favorite shade. The holo finish in this is also very subtle, so you need good sunlight to get a real look at it. Formula was pretty good and easy to apply, though you do have to mind your brush strokes just a bit. One thing I'll say is that I was pleasantly surprised by how opaque this was considering it's a lighter shade in the collection. Swatched here in two coats and sealed with Seche Vite topcoat. 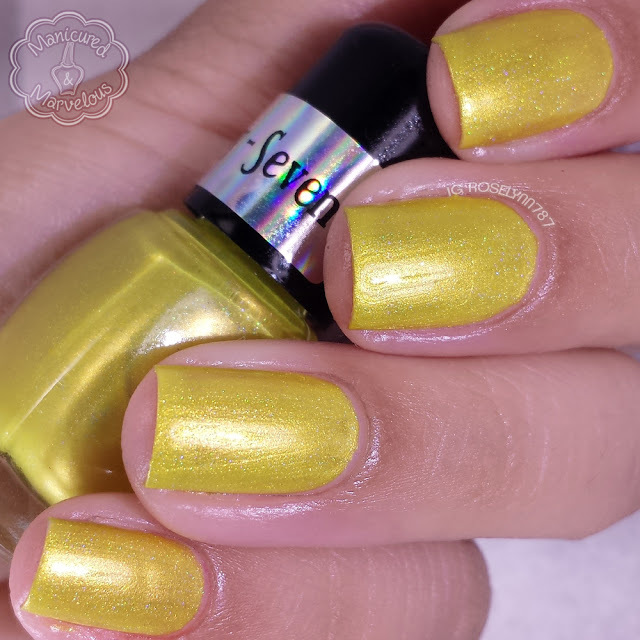 Zeke is a lemon yellow holo polish. I really wish this color didn't clash with my skintone as much because I really wanted to love it. If yellows are your thing though, you're definitely going to want this one. It's such a great tone for the summer! The holo finish in this one is very subtle like in Clementine and Aspen. Formula was a bit sheerer than some of the others. You really have to focus in on the photos, but my nails are a bit visible so a third coat would of solved that. Swatched here in two coats and sealed with Seche Vite topcoat. Paisley is a hot pink holo polish. Normally I would say I'm not a fan of the color pink, but there is just something too sassy about this color that makes me love it. Same consistent formula as Cash and the other richer toned colors. Shown here in two coats and sealed with Seche Vite topcoat. Overall I am left with quite a satisfied impression of this relatively new indie on the block. Although the collection itself is fantastic, I do have to say it doesn't feel entirely unique. We're in the summer of bright & neon collections running rampant so it's obviously to be expected to have that tinge of familiarity. Personally I did not own a set of bright holo polishes like this so it's a perfection addition to my stash. Again my must-have picks are definitely Cash and Aria, with Paisley and Harmony coming close behind. What about you guys? Which ones did you love the most? 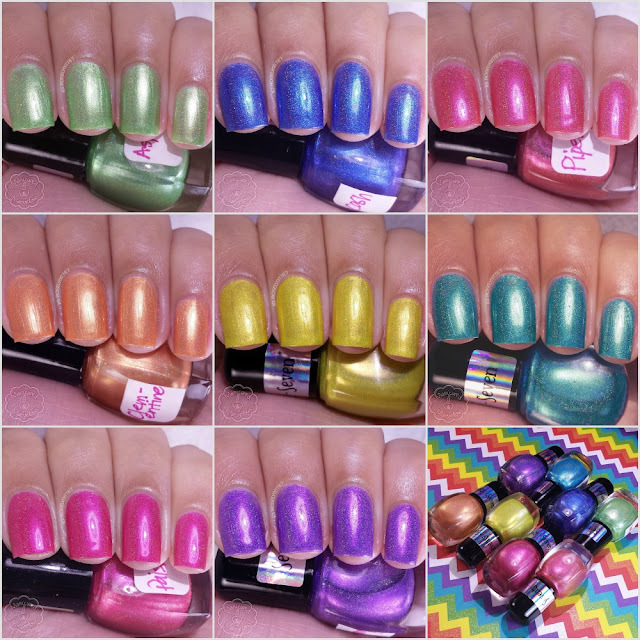 The Bohemian Rainbow Collection by Seventy Seven Lacquer is currently available for pre-sale through Sunday. The official release date will be Friday, June 18th. All are really pretty! Happy Birthday to your dad! Neon holos! So pretty! Have fun with your dad! Thanks a lot :) These are definitely even prettier in person. What a vibrant shades! The metallic finish isn't really my favorite but I love all the different colors. Agreed! I'm still wearing that one now. I need to know...did Aria stain? No staining from Aria! I'm so excited to have a teal I can wear without fear of removal. Beautiful swatches! I like Cash a lot. What a beautiful set. Aria and Harmony are my favorites. Ohh, this is a lovely collection! I love Cash and Aria! That's my favorite one too! Ooohh wow. I love that slightly frosty finish, and I think Cash is my favorite. Thank you for explaining application on them, that's a great detail to add! There are some pretty ones in there for sure! Of course I like the purples best. Pretty! I love Cash and Aria! This is a nice set for summer. I think I will wear them as pedis! Cash is sooo gorgeous! Love blurples!!! Don't blame you! It's a stunner. Right?! I love those bright but deep shades, so gorgeous in the sun. Pretty swatches! I think that Harmony is my favorite! Thanks a lot. It's a great shade! Pretty swatches! This seems like something worth checking out. It has great colors and the holo effect of each is stunning. A must try indeed!